Lent 2009 is upon us. For over 8 weeks now, I have been vacillating over this liturgical season and what I was going to do with it. Last year, I examined my conscience with The Examination of Conscience Guide from the back of my First Communion missal (as beat up and tattered as it may be) and thought about what to give up....what to sacrifice in order to strengthen my relationship with God. I've never really understood what Catholic guilt is, but I assume it rears its head this time of year. "Jesus gave up His life, Susie. Surely you can give up candy for 40 days." As a kid, after confession we'd go around saying, "Ihaven'tsinnedyet! Ihaven'tsinnedyet! I'mstillpure!" as if it were a contest to see who could go the longest without sinning. By the time the lunch bell rang, I'd forgotten to keep up with my Sin-O-Meter. I didn't know if I'd participated in some estrangement with God, so I'd give up the game and continue being an amoral child. I still don't know what I am going to give up, with less than 10 hours to go til Ash Wednesday commences. But I'll figure it out. What is do know is: I may live in the South and it may be characterized as being slow, but I'm ready to fast. I don't want to interpret things wrong or tell you an untruth, so if you have any questions, I'm going to direct you to The Catholic Encyclopedia. It's like...just because I'm black, people ask me questions about "being black" all of the time, and I have no idea. There is no "black encyclopedia." And if there is, it's a farce. Ask me about literature. Ask me about food. I know about those. Speaking of food, I made a fast-friendly meal that I plan on duplicating for the next few weeks. Simple and easy, these chips can be substituted as crackers. Stack 3 or 4 tortillas and with a pizza cutter or a sharp knife, cut the tortillas into 8 wedges. Next, spray a baking sheet with a thin coating of nonstick spray. Spread out the tortilla wedges in a single layer. Spray the tops of the tortillas. Sprinkle the wedges with the salt and pepper. Put the sheets in the oven, and bake the chips for about 6-7 minutes. Then rotate the sheets and cook for another 6-7 minutes. It looks like something Oliver Twist or Charlie Bucket would be made to eat, and they probably did at some point or another. The only difference? This is made with love and pumped pull of nutrients. Saute onions, shallots and carrots in olive oil until onions are translucent. In a sauce pan, add peas, broth, salt, pepper, cayenne, bay leaves and butter lettuce. Bring to a boil. Add sauteed vegetables and flaxseed oil. Simmer for 10-15 minutes, covered. Blend with an immersion blender, if desired. Mmmm! Pea soup sounds delish! I rarely comment, but I love getting ideas from your blog! It would be great to have you a part of a community of other young catholics trying to walk in thier faith while life buzzes all around us! Nikki, I love the honesty in you and the way you communicate it. I myself gave up organized religion many years ago when I realized it had absolutely nothing to do with my faith. I've believed for many years now that the sacrifice I need to make during Lent is not to give up anything, but rather to add something to my life that can help humanity. Just my thoughts. Love the Pea Soup recipe. I too gave up organized religion many years ago, but that doesn't mean I don't know where you are coming from. I am a former alter boy and I graduated from an Episcopal school. I just found that there was something not there for me in an organization as far as my personal faith went. I'm not very good at self-denial, so I don't really do Lent. I am trying to drink less booze, though more for weight loss than for religious reasons! Your soup looks very nice! The tortilla chips and soup look verrry delicious. I'd love a little guacamole to dip the chips in. Best snack ever. Vicci, no butter lettuce isn't common. 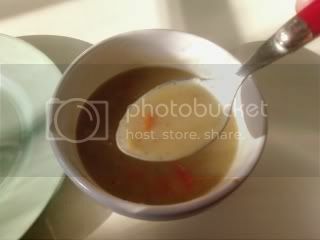 I put it in there for texture and I liked the way it crunched and slid across my tongue when I ate the soup. Something heartier, like the outer leaves of a head of romaine would be good as well but not as flavorful or sweet. We need to try some pea soup. So interesting that you have lettuce in there! I just love pea soup! YUM!! 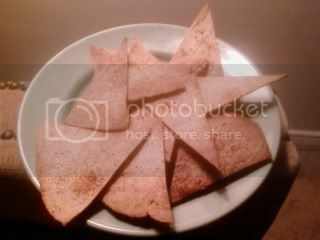 those tortilla chips look great too! you go girl!